Notes... what are they good for? 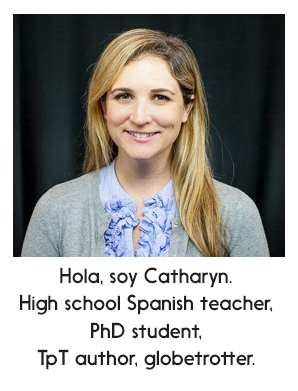 To take notes or not to take notes....That has always been a critical debate for me as a foreign language teacher. I hate the outdated structure of standing up in front of the classroom and having students copy down every word you say. 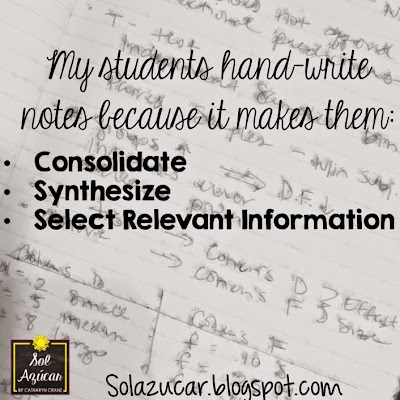 But, when teaching new content, sometimes direct instruction using a notes format is necessary. For my Spanish 1 students, I love these "Animated Grammar" videos by the Avancemos Book 1 text, as a useful content delivery method. I've seen that the videos really engage students in a different and meaningful way than me standing up and lecturing. I love using grammar videos, youtube tutorials, websites, etc. to change up the content delivery process. If students are so receptive to electronic resources for content delivery, then should we have students write notes electronically too? After all, taking notes electronically is likely a useful 21st century technology literacy skill. I know if you popped into a university lecture, you'd see a class full of open laptops and students typing away. Maybe some of the older students (me!) would have out their good old moleskin, pen, and highlighters, writing notes the old fashioned way. Bullet point by bullet point, one messy misspelling after another (in fact, see my stats from yesterday in the picture below). You can't deny that handwritten notes have their flaws. Handwritten notes can be sloppy, non-linear, error laden, and maybe hard to read retrospectively. 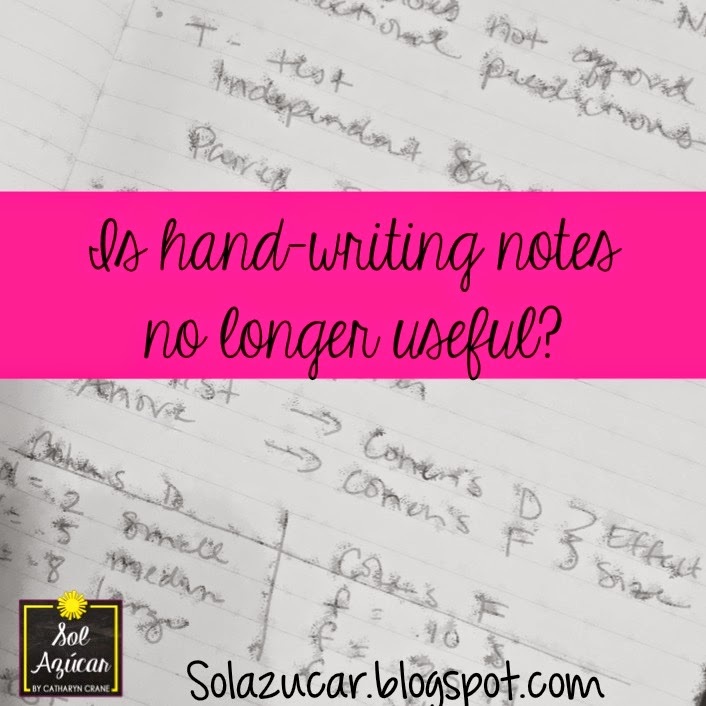 Handwritten notes can't easily be emailed, archived digitally, or edited. Is handwriting becoming antiquated? Indeed, it is quite feasible to imagine a future where handwriting no longer exists. Many academics argue that this would be a very bad thing. I was fortunate to take a class last semester with Dr. Steve Graham, who is one of the leading academic proponents of the need for old-fashioned handwriting in schools. In an NPR report weighing in on the cursive vs. basic printing debate, Dr. Graham explained that it's not how you hand-write information, but that you do so in the first place. Educational research indicates that hand-writing information allows students to manipulate content and in turn, learn information better than when typing. When typing, students are more likely to dictate content word for word, while when hand-writing, students more often abridge, consolidate, and synthesize information. 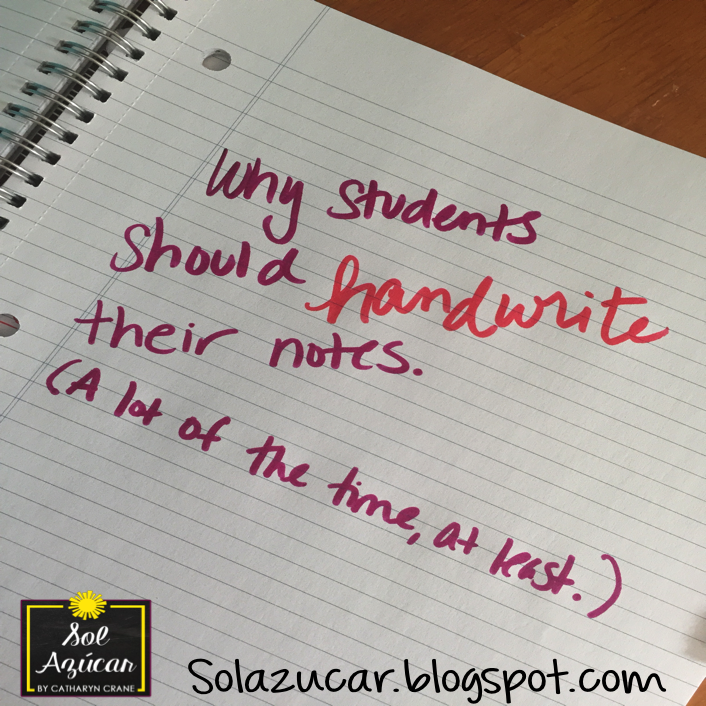 These important learning practices happen because hand-writing simply takes longer than typing. The research on hand-writing indicates that guided notes should be used sparingly in the classroom. 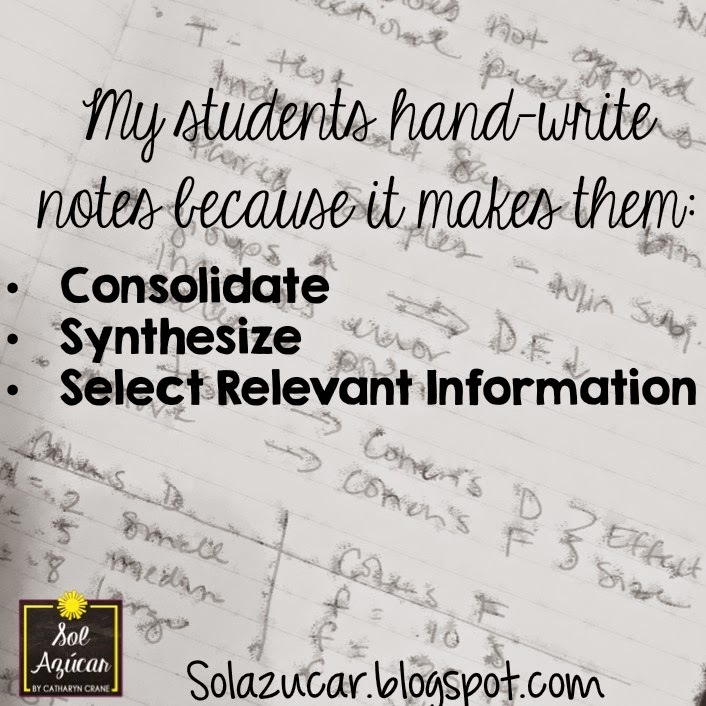 Students should be writing and formatting their notes on their own, in a way that makes sense to them. They should be shortening content, categorizing content on a page, and writing down what is most relevant to them. Not filling in the blank. Direct instruction is necessary. But should occur rarely. Notes are necessary. But should occur rarely. Notes formats should not be dictated by the teacher. But... any classroom teacher knows that this ideal is easier said than done. 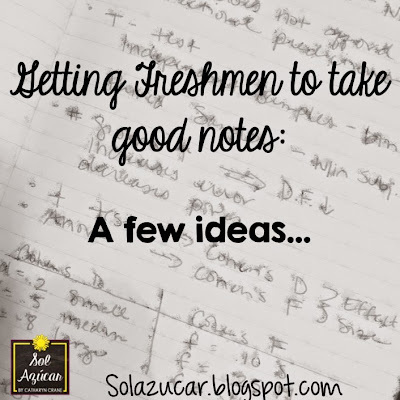 How do you teach students to take good notes? See Part 2 of my Notes Series "Empower Students' Note Taking" for ideas on how to scaffold and empower students' note taking.